After Joshua's death and for about 350 years (until Saul), Israel was ruled by "judges". These "judges" were military leaders and champions who though often identified as spiritually capable were more often fighters than preachers or prophets. Othniel, Ehud, Deborah, Barak, Gideon, Jephthah, Samson, Samuel, Shagmar, Tola, Jair, Ibzan and Abdon. Remember also, during the reign of the judges, Israel was still not a unified kingdom but 12 separate tribes loosely connected by their religious covenant with God. I say loosely because over and over again they forgot their covenants. Why or how do you suppose the children of Israel forgot their God so easily within just one generation? What can we do to strengthen the next generation/our children? Judges 2:14-16 What can we learn from this cycle? You will note this pattern throughout this lesson and the scriptures. The children of Israel forget their God. He refuses to fight their battles until they remember him. They are left to be spoiled by worldly armies and influences. When they are hurting bad enough, they remember their God and call on Him and then He raises up deliverers to save them. This cycle can be seen throughout history and throughout scripture. Judges 4:1 "and the children of Israel again did evil in the sight of the Lord"
Judges 4:4-5 Deborah was a "prophetess". What does this mean? Did she lead the church of God? ‘The spirit of the Church of God is that manifested by Moses. … The genius of the kingdom with which we are associated is to disseminate knowledge through all the ranks of the people, and to make every man a prophet and every woman a prophetess, that they may understand the plans and purposes of God. For this purpose the gospel has been sent to us, and the humblest may obtain its spirit and testimony’ (in Journal of Discourses, 12:46). Judges 4:8 What seems pretty obvious is that this was a time where there lacked any notable priesthood leadership. Even Barak, another judge, seems unwilling to follow the Lord's instructions without Deborah's encouragement and presence. This is not to say there were not righteous men or righteous leaders but in a patriarchal society and a patriarchal priesthood, Deborah stood out for her obedience and righteousness, her leadership and her ability to foresee (v.9). She had the Spirit with her and that spirit, coupled with her faith and strength, made her a noteworthy leader. 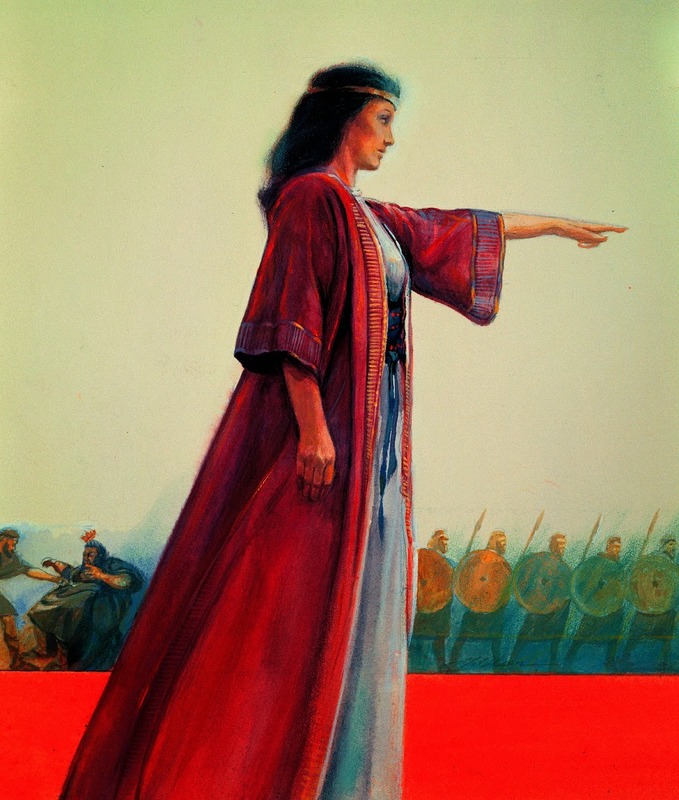 As prophesied by Deborah, Sisera (the captain of the Canaanite armies) armies are overwhelmed but ultimately a woman called Jael kills him. Judges 6:1 "And the children of Israel did evil in the sight of the Lord" Once more we see that the chosen people had chosen the wrong path. 7 years of Midianite oppression as a result. Judges 6:15 "Oh my Lord, wherewith shall I save Israel? My family is poor in Manasseh and I am the least in my father's house." Gideon does not feel he has what it takes or what people would expect of a deliverer. Surely their deliverer would be a man that is big and strong and well trained in fighting or politics? But what does the Lord see in him? v.12 "...thou mighty man of valour"
v.14 "Go in this thy might"
What makes a man "mighty"? v.12 "The Lord is with thee"
v.16 "Surely I will be with thee"
And then in v.23 the very reassuring "thou shalt not die." And He further declares to Gideon that this mass migration of Midianites will be defeated as if they were just a single man (v.16). You can just imagine young Gideon wondering if this is this really happening? I dont think his test in v.17 is a sign of his lack of faith in the Lord but rather his lack of faith in himself. He just can't believe that he is the right man. It's almost one of those "Am I on candid camera?" moments. But this is not tv this is the real deal, the Lord has called him. This mighty man of valour had been called to deliver his people. Judges 6:30-31 I love these verses. If we are to tie this in and compare to our initial reading in Judges 2, on the one hand we have parents and children that really slacked off and forgot about the Lord while on the other hand we have just been introduced to this wonderful young man called Gideon and if you want to know where he gets his strength and his valour from, just read these verses. This is a righteous parent. He could have done the politically correct thing and apologized for his son and tried to appease his neighbours but instead he backs his son to the hilt and asks them to answer very tough questions about how their god is not speaking for himself! It's powerful parenting, especially considering he had not to date been as bold, as his son had just been, in destroying the altar and groves of this false god. Judges 7:2 I find this verse kind of sad but also kind of awesome. The Lord recognizes that the children of Israel will only boast if they go in to battle and win with all their numbers. So he just cuts their 32,000 down to 300 by keeping only those who had faith and who were alert and aware. Remember, the Midianites were like "grasshoppers for multitude" and just their camels numbered as "the sand by the seaside" (v.12). I find it interesting because when we see odds like that in life we panic and we think something is wrong. I wonder how easier we would make life if when we saw those kind of odds instead of stressing, we just calmly took the attitude that it is the Lord making sure we know His hand is protecting us, not ours! 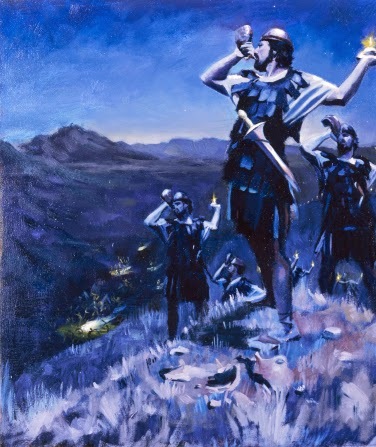 And so with just 300 men, horns, pitchers, lamps and their voices Gideon and his people defeated an army of thousands. They may just as well have had only Gideon and a toy gun and they would still have won - because the Lord was on their side. Our numbers may be few in . We may not feel we have all the weaponry or skills or certificates to do what we have been asked to do or called to do in life but with a little bit of spiritual wisdom and with our own spiritual light we can raise our voices and sound that trumpet. The Lord is with us and with Him nothing is impossible. In the glorious cause of truth." "The Lord has a great work for each of us to do. You may wonder how this can be. You may feel that there is nothing special or superior about you or your ability. Perhaps you feel, or have been told, that you are stupid. Many of us have felt that and some of us have been told that. Gideon felt this when the Lord asked him to save Israel from the Midianites. Judges 13:1 "And the children of Israel did evil again in the sight of the Lord" When you review how often after deliverance the people return to evil it makes you wonder why the Lord continues to send deliverers! Certainly he is sometimes a little slower to hear their cries - as shown here. This time the people are subjugated to 40 years of Philistine oppression for their disobedience. Notice the difference in the story arc. Whereas before we had people who were not typically regarded as deliverers Deborah (a woman) and Gideon (the least among his family), here we have the very epitomy of a typical deliverer. Samson is chosen from birth. Born from miraculous circumstances, of godly parents and brought up in the holy Nazarite covenant he looks the part and plays the part of deliverer. He can kill lions and catch foxes and burn crops and kill a 1000 Philistines with a jawbone. He's big and strong, what could go wrong? Samson is apparently asked to go undercover into the enemy camp, marry one of their women and presumably destroy the Philistines from within. But this is where we see Samson's weaknesses. He is able to infiltrate the camp and ultimately kill some Philistines but not before showing his susceptibility to the charms and wiles and seductions of women. Still, with his mission seemingly accomplished Samson becomes a judge in Israel. Not a surprise everyone expected it from birth! But then he sees a harlot and goes in unto her. Long before he had his hair shaved off, Samson broke his covenant. We are told he saw the harlot and then goes in unto her. That would suggest this was not premeditated but that again he succumbed very easily to temptation. This weakness has become not just a chink in his spiritual armour but a gaping wound. By the time he is in a relationship with Delilah it is not he who is in control and plotting, but the enemy. With his weakness identified, and the tables fully turned, Samson is now the target and Delilah is the bait. Samson falls for it hook line and sinker. What is even more astonishing is that he must be aware of the danger she poses to him. 3 times Delilah asks for the secret to his strength and tries to take it away from him. Why would Samson tell her? Surely he knew by the third time what she was trying to do? Maybe he did know but just thought that he was invincible. Maybe he thought he didn't need the token of his covenant (he had already broken his covenant before), maybe he had started believing that the source of his strength was himself. It is a sad tale of lost potential, of lost life and lost virtue. Samson represents us all. We have everything going for us - we have the gospel, we have our covenants, we have the Lord on our side. But we are in danger. Where Joseph of Egypt fled, Samson stayed and wanted more. Power from God is dependent upon virtue and obedience and purity. If we tiptoe in temptation or dally in sin we will lose that power. Ultimately, Samson perished by the very power that once made him invincible. He was, at least on the surface and at the beginning, the perfect looking deliverer but more perfect were the hearts of Deborah and Gideon. As Saints we know that the Lord looks not on the outside but on the heart. Are our hearts pure? If so, the Lord has a mission for each and every one of us. It is a mission of great importance. It is your personal call to the greatest work of all. You do not need to be big and strong and good looking. You don't need certificates and honors of men. You just need to be willing, to have faith and to have a pure heart. Just wonderful, thank you for making comparisons to today. Great read and lesson. Thank you Susan. I'm really glad you enjoyed it.